Did I buy in last winter or autumn? I just when to the department store and bought it after testing. I don't really use lip-gloss so I just turned around after applying to my lip. Hm…it’s just a normal color that is commonly found.. and than when I got into the elevator, I Looked at myself at the mirror and was surprise how it helped my face to healthy even though I didn’t have makeup on. Made me to look younger! Is it the power of the pink color? There is a slight difference and that difference catch the eyes and stimulates the heart. In Korea, among 1,5000 women age 20~30, color pink is there signature color so there are many pink to be found. So there are many pink you can find and tired of seeing pink. 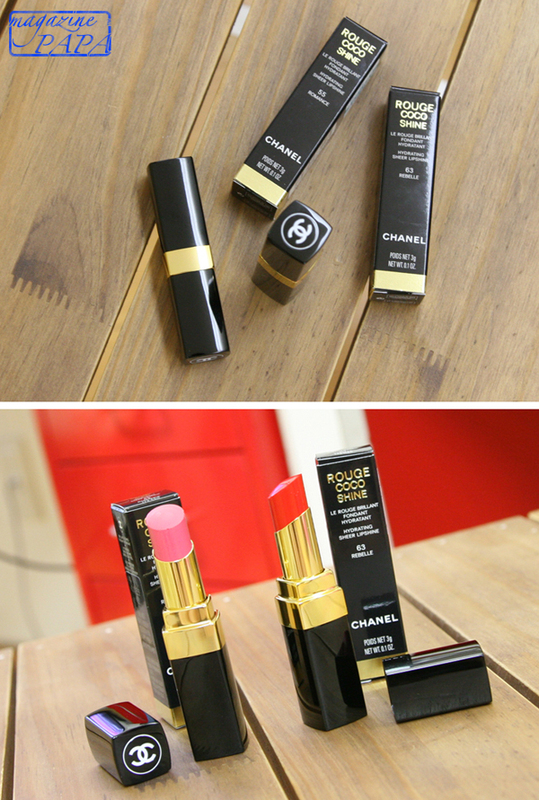 Chanel Rouge Gloss 57 Insolence was little bit different. I think I have to go back to the department store and by this lip-gloss even though I don't usually wear lip-gloss but I think I have to run to the store next morning and buy this lip-gloss. I won't really talk about the stickiness because usually lip-gloss is sticky. If it doesn’t it won’t last long. Anyway if isn’t Bobbi Brown lip-gloss it’s fine!! The stickiness is like if the wind blows the hair will stick. It’s not like you are going to die because it’s too sticky. The color isn’t too transparent. The color is bright pink that give intensity of color. So you can control the amount and choose from what kind of pink color you want. These are just red and pink color. The lipstick case is same as rouge coco but overall the case it slimmer. It’s not anything but become light and younger. The intensity of color doesn’t have any effect. 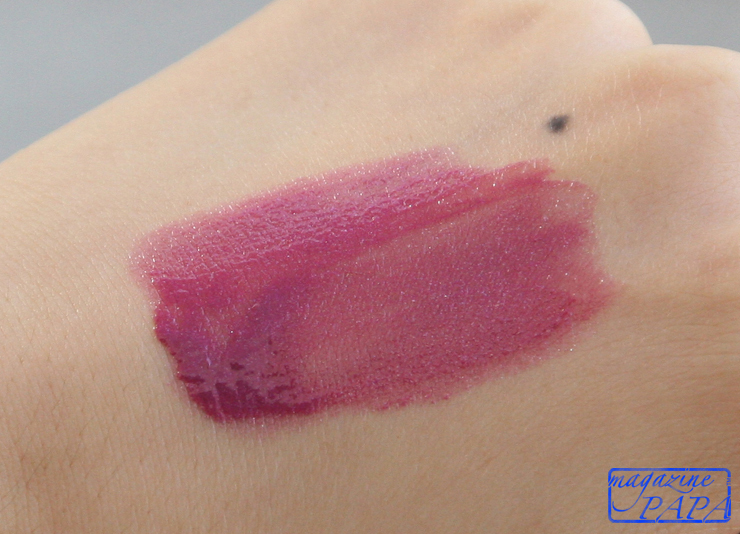 The lipstick gives different effect according to the individual skin shade. The color depends on the actual lip color and what base you use. So it is very important to try out first before purchasing. I took this picture to show only how it is applied. Even though you applied several times, it makes it look transparent. The ones I choose is looking moisturizing and without glitter. This feels more like a caring lip balm lipstick. The darker reddish color is 63 Rebelle. The value of red color is kind of high so when you apply it might look cheap or when you wear it well it can look chic. This has two kinds of face. This color goes well for pale skin or even yellowish color. However for dark and dull skin color, it might be a horror movie actress lip color. The color beneath is pink, 55 Romance. The color is shown thicker in the picture. It is little bit lighter than the picture. However you will always have to try on before you buy! I tried this color onto every friend I meet and to students that I teach. Everyone loved and about 99% of people around me bought this lipstick. You have to remember that all the lip color looked 100% different according to each person. Every one looked as if they applied different lipstick! People have different color of lips color so applied wetly or clearly depending on the lip. So the color mixes naturally with the actual lip color! You don’t have to apply lip base and the color matches well with the original lip color that gives out different color! Thinking of this color to be easy color is truly the follower of Magazine PAPA.. This is really a fine color. It looks fancy and lovely. According to the image, it looks elegance. For dark or dull lip color might be hard to show off the color without applying lip base. Even though you applied, lip base, it won’t definitely show brightness that well but can look charming. So instead of being lovely, it’s more of being chic. The dark color of lip meets this color turning out to be calm pink. It would take this color of lipstick naturally however it doesn’t present to be so lovely. First apply some lip base or concealer or foundation covering the reddish color and apply it. These two products have great application. Comparing to these moisturizing lasts really long. 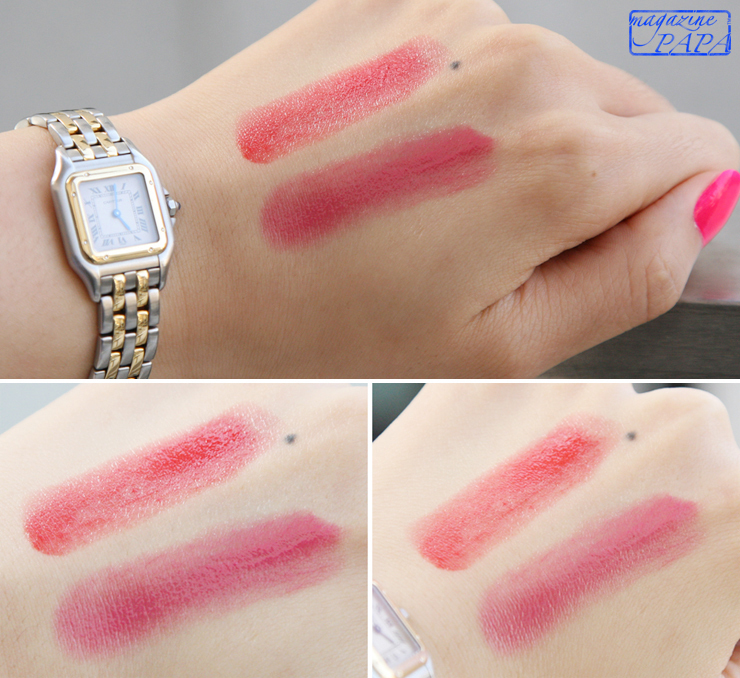 The texture is similar to Shu Uemura lipstick not emphasizing on the wrinkles of the lips. However have to take care of the keratins on the lip. Apply some lip balm a lot and take out it with the twizzer. Or this lipstick itself has very rich in moisturizing so apply this many and make the lip in a stage where keratins can be easily peel off. After that it well turn out to be baby lip again! The negative part about this product is that it shrinks fast. It makes me to think of buying another lipstick again. Pretty soon I have to go back and test more products on this kind of lipstick and buy one. I was on my way to Lotte department store to buy Sum: 37 cosmetic and at the same time I bought this lipstick and brought this home with me. It is like purple rose bloom onto your lip. The cool colors of purple and maroon are showing more than pink. When I was passing by the stand, the color caught my eyes so I just bought it because I like the color but didn’t go so perfectly with my face tone. This is like Chanel lipstick on above very moisturizing and watery than to be actual lipstick. The biggest difference is the glitter. As shown in the picture there is some fine glitters. I don’t really like glitter lipstick however this product have unique moisturizer that covers up the glitter so I bought it. The product itself is very moisturizing. The skin color can be seen through when there is less lipstick applied. When you apply thick, the color can be definite however it might look too heavy. The purple color and maroon color mixes with each other even the silver glitter gets cover by the glossiness. 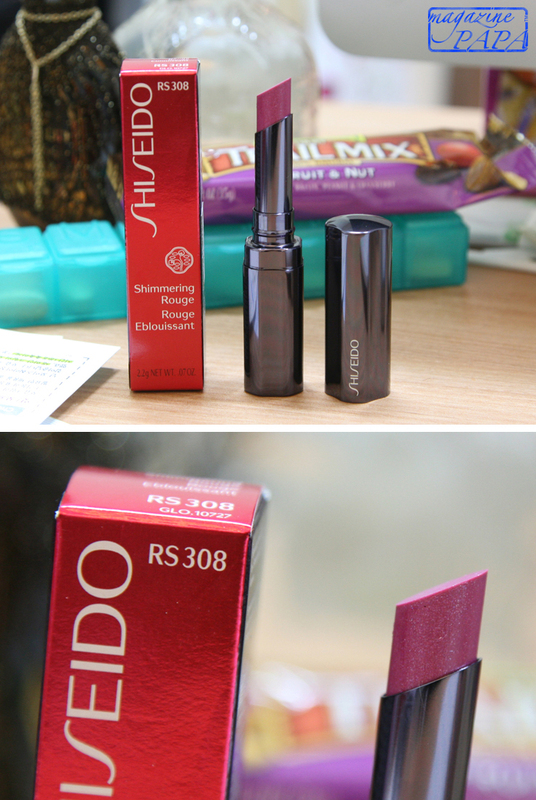 It applies well and the stick is really thin so easy to apply on the lip. As well known, using the lipstick directly onto the lips is sanitary so many use lip brush. However these lipstick that I review today, is too moisturizing so it’s better to use it directly from the stick to achieve the color. You might not like the feeling so don’t share with other people and use it by yourself. Before using the lipstick, wipe the lip with the wet tissue lightly. Also it will be better to wipe off the surface of lipstick however for this lipstick, it takes away the product too much. Chanel Rouge CoCo Shine 55 Romance was applied onto my face. Just look only on the lip color from the pictures that I post now. Actual lip color isn’t this dark just consider this picture on how lipstick looks and test the product before you buy. I didn’t where any makeup except this lipstick only. My hair is messy due to several days past after perm. Also this is only dry with drier and hands only. No brush was used. So as like before neglect my face but look at my lip color only. 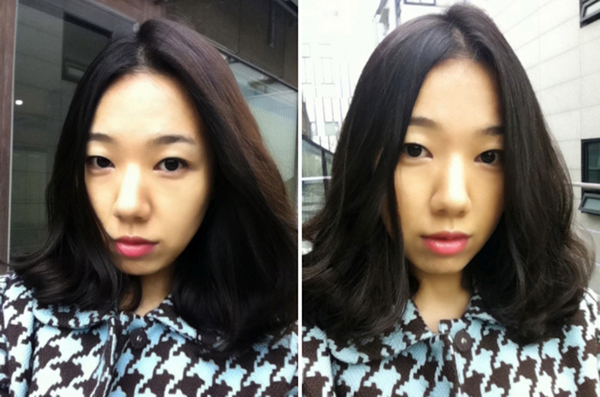 I tried on Chanel Rouge CoCo Shine 63 Rebelle on no makeup. Again the color appears too thick. 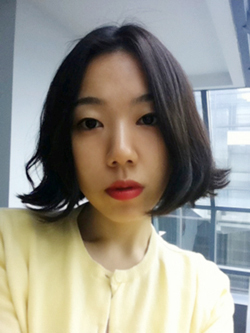 This picture is taken on wearing Shiseido Shimmering Rouge RS 308. I don’t know if you can feel some purple color. Is that only my thought??? All of these colors make your face to look healthy and give point on your face.